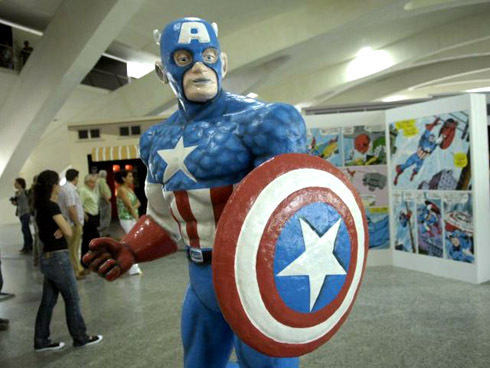 The superheroes of Marvel Comics have flown into the Prince Felipe Museum of Sciences (location), where they are part of an exhibit that seeks to explain science to kids in an accessible, fun way. Iceman presides over an exhibition about flamingos ice, Spider-Man introduces kids to the strength of spiderwebs, and Magneto presents “What is a magnet?”, then uses his evil powers to crush your skull. Hi Kids, Let Me Teach You About Super-Soldier Serum! “So it’s true that spiderwebs are strong?” Yes. “But people can’t really produce spiderwebs through their wrists?” That’s correct. “But if they could, they’d be able to swing on them?” Ahhh… I don’t think so. No. “But Spider-Man can?” Oh my god, kid, shut up. Acutally, it sounds pretty cool, and might be a perfect way to escape the heat… especially if you have kids. Visitors get to complete certain missions, such as yelling at a certain decibel like the Banshee to defeat the villain Sentinel. You can climb a wall like Spider-Man, and try to help prevent Bruce Banner from flying into a rage. One note: I read about this story in ADN, who starts their article with an anecdote about how the Flash got his powers. Cool enough, I like the Flash — but he is a DC and not a Marvel character, as any comics geek worth his salt could tell you. I probably shouldn’t admit that I noticed this, let alone that I’m annoyed by it, but there you have it. The Flash won’t be in the exhibit at the Museum.